Where are you from and where did you go to college? I was born and raised in Chicago, Illinois. I went to Claremont McKenna College where I double majored in philosophy and economics so as to be able to feed body and soul upon graduation. When did you know you wanted to be a priest? The basic desire to do whatever was most important in life was there since I first had any ambitions at all. The calling to priesthood didn’t explicitly start to emerge until senior year of high school and I managed to resist it until my senior year in college. Could you say a little bit about your faith journey? Growing up my family went to Mass every Sunday (even on vacation) and my father would pray with me every night before we went to bed until I was in about fifth grade. Despite the somewhat pious upbringing and a strong sense of duty I would not have described myself as personally pious. I did not protest going to Mass but I cannot ever remember looking forward to the experience or feeling anything when I prayed. In fact, from about the age of five I became very interested in money and girls—two obsessions left unabated until senior year of high school. When I was a junior in high school I began reading some of the works of St. Augustine and St. Thomas Aquinas, which I happened to find on the bookshelves in my room. It was a revelation. For the first time in my life I encountered intelligent people who wrote intelligent things about theology and I experienced the beauty of truth. That started to awaken things in my heart that had been dormant for a very long time. At the beginning of senior year of high school I made a good, long overdue confession. It felt great but that was quickly followed by a short and intense period of spiritual darkness that wrought the deepest part of the conversion. As the darkness lifted what remained was desire to pray, to go to Mass, and to love God in general. What is the biggest challenge young people face? That’s like asking, “Who is the most dishonest person in government?” So many choices. A top contender would be a culture that promotes disconnection or superficial connections between people as opposed to deep and lasting friendships. What Catholic devotion is most fruitful for you? Offering Mass. If I could keep only one spiritual practice in my life it would be that. It grounds everything else. What advice would you give a young person thinking of a religious vocation? Marriage? Jesus said, “If you are faithful in little things you will be faithful in great ones.” Do the little stuff right every day and the big questions will sort themselves out. That means daily prayer, Mass at least once a week, regular confession, and works of mercy. Habemus Sacerdotem! We Have a Priest! The Saint Benedict Institute is delighted to announce: We have a priest! Fr. Nicholas Monco, O.P. has been appointed as the Saint Benedict Institute chaplain with a full-time ministry to Hope College. He begins his ministry on August 1. Fr. Nick was born and raised in Chicago. He went to Claremont McKenna College in California where he majored in philosophy and business. He then pursued the priesthood with the Dominican Order of the Midwest Province. He received a Master of Theology and Master of Divinity degree from the Aquinas Institute of Theology in St. Louis, MO, where he also earned a Certificate in Thomistic Studies. 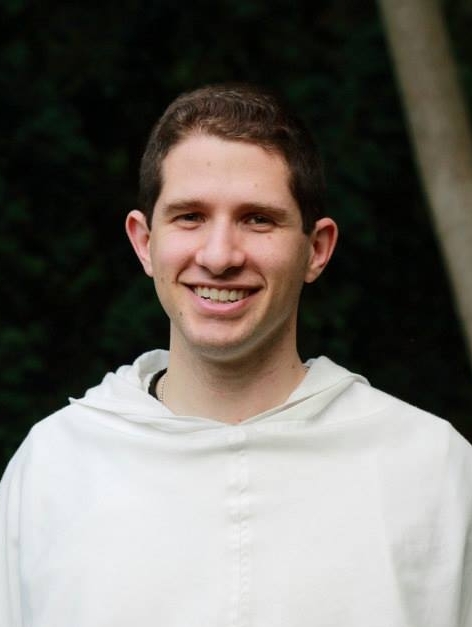 He was ordained in 2013 and has taught Theology at Fenwick High School in Oak Park, IL, for the past four years. We feel particularly blessed to have Fr. Nick join the Saint Benedict Institute staff. Once the school year begins, Fr. Nick will offer daily Mass on campus, frequent confession, and weekly adoration. He will lead Bible studies and the rosary as well as the Vocation Discernment Program. Fr. Nick will be essential for our goal of forming students intellectually and spiritually so that they will be thoughtful and joyful witnesses to Christ's love. We also feel particularly blessed to have so many friends and benefactors praying for us and supporting us financially. We could not have done this without you! That said, we still need your help! Please keep praying for this ministry so that Fr. Nick will reach the students God wants him to reach. And please consider supporting us financially, either through a one-time donation or by joining our monthly giving program, the Saint Benedict Society. Your prayers and financial support will ensure that this ministry will continue.